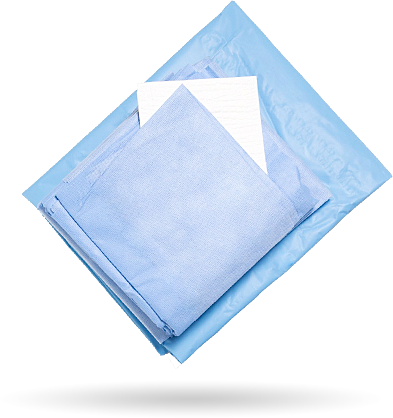 1stQ offers a comprehensive range of drape packs for all ophthalmic procedures, function-oriented as usual, and consisting of individual high-quality components. 1stQ procedure packs mean an optimised material usage through customer-specific production, plus a lean administration procedure through convenient order transactions. These are important benefits, saving time and ensuring a smooth work routine in the operating theatre. Benefit from the vast potential of individual solutions! For more detailed information please contact the assigned area manager, distributor or the 1stQ customer service by calling +49 621 717-6330. Alternatively, you may fill the Contact form right here. Our individually composed procedure packs carry certified CE labels and are made of high-grade single-use raw materials. The drape fabric comes with customized high-precision press cuts.